Ohio State Suspends Football Coach Amid Allegations He Ignored Abuse The Buckeyes recently fired an assistant coach after a domestic violence incident from 2015 was reported. Urban Meyer has been accused of knowing about it, but keeping the coach on staff anyway. 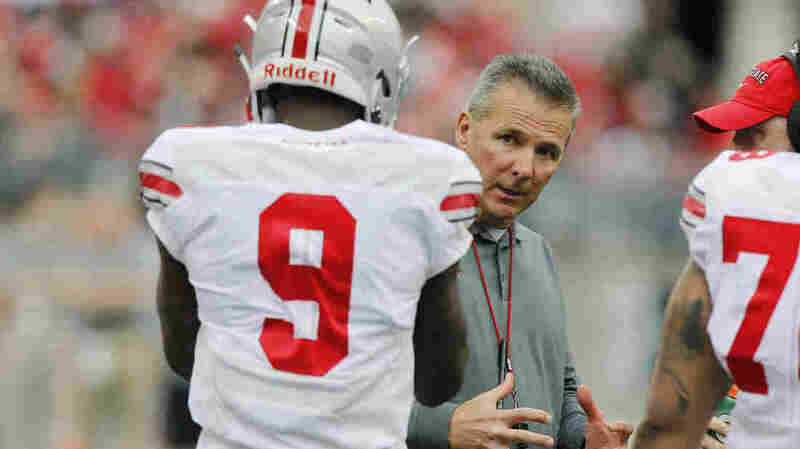 Ohio State head coach Urban Meyer, talks with a player in April in Columbus, Ohio. The coach, who has won three national titles, including one for the Buckeyes, has been suspended as Ohio State investigates whether he failed to report an assistant coach's domestic abuse. The Buckeyes coach was suspended Wednesday, a month away from the highly ranked team's opening game, as Ohio State investigates whether he chose to ignore his subordinate's violence, reports NPR member station WOSU. "[Assistant coach Zach] Smith's ex-wife Courtney Smith tells Stadium TV that Meyer's wife Shelley knew of the abuse. "Smith says she does not know if Shelley told her husband. " Veteran college football reporter Brett McMurphy, who broke the story of the 2015 incident, notes that if Meyer or his wife — a nurse at the university — failed to report the domestic abuse, they could be in violation of Title IX. That could lead to their being fired for cause. "Courtney said she called 911 'a handful of times' over the years but didn't always pursue charges.
" 'I hung up out of fear because I was scared Zach would lose his job,' Courtney said." The couple divorced in 2016, The Associated Press reports, and Courtney Smith told McMurphy that she recently received a protective order against him.